Malton is commonly known as Yorkshire's Food Capital. 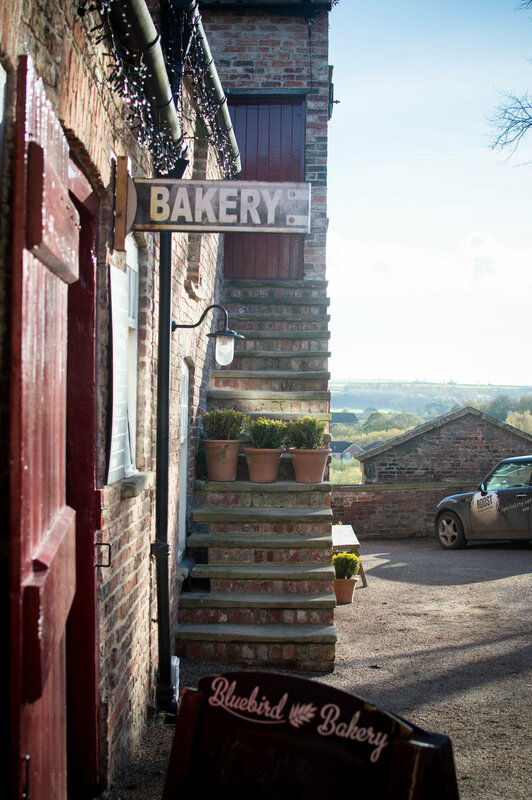 It's renowned for it's artisan food producers, a cookery school, cafes, restaurants and of course it's yearly Food Festival that attracts some of the biggest names in cooking (26 & 27th May 2018). Every second Saturday they have their Monthly Food Market and I've been hoping to visit it for several years but work and life always stopped me from getting up there. Fortunately the weekend we were staying nearby, the market was on so it was perfect timing. We headed over on what was a gloriously warm, sunny morning for a bit of a mooch round and of course to indulge in my favourite pastime, eating. First up was a visit to the market which has 35 specialist stalls, some outside, others in the Milton Rooms where they also hold cookery demonstrations.The market was packed with people and it was impossible to get in and take any photographs but we browsed the stalls looking at impressive artisan loaves, humongous cakes and brownies, teas, local wines and ciders. I was on the lookout for vegetarian food and came across Mind For Cooking who had a beautiful stand full of rainbow colour dishes - huge slabs of potato, onion and mustard tart, spinach and lentil boreks, samosas and Moroccan pastries which were a feast for the eyes. I bought a few things to take back to the cottage for dinner that evening. I was also really pleased to see that Baytown Coffee had a stall too as I always like to pick up a bag or two from them when I'm over at the coast (they roast it over at Robin Hood's Bay) and I'm a huge fan of their Albion Street blend. They have released a special edition Christmas Blend too so I had to treat us to a bag which will be kept for the festive season. Always on the lookout for a good vintage shop I knew that The Shambles was the place to go. Instagram chum Rosana has often shared little vignettes from here and I was pleased to see that it was every bit as lovely as she'd photographed. (Please check out her feed and give her a follow as she is one of my favourite IGers from Yorkshire). There are lots of great stores to rummage in for vintage as well as Woodlark Furniture who design and make furniture and sell beautiful chopping boards from oak, elm, ash and sycamore. I'm kicking myself for not photographing his shop as the boards were stunning. Towards the end of the row were where I found my two favourite vintage stores - firstly Primitive Pumpkin where I was drawn to their pretty shopfront and the little display of shopping baskets on wheels. I love the idea of owning one, filling it full of bread, cheese and wine and then wandering home through country lanes. Instead I'll have to make do with my bag for life and sticking the shopping in the boot of the car as I'm pretty sure I couldn't pull this basket up Leeds Ring Road. Ahem. Inside was a treasure trove of vintage fabrics, decorative homewares and a simply stunning larder cabinet in the palest of grey shades (which the lady who was working there informed me was sold, so some lucky person is taking that home with them). Directly opposite The Primitive Pumpkin is 'Once' run by Siobhan. This was the vintage shop of dreams for me and I was impressed by how many brilliant pieces she had for sale. That kilim in the picture above was of an amazing, rich in detail, in excellent condition, was stunning to look at and I really, really wanted it yet I think it was too big for my living room. Sigh. Inside was an eclectic range of earthenware, lighting, ceramics and original artworks and my eye was immediately drawn to the sunflowers picture (top image in the post) and although I didn't buy it, I am still dreaming of it hanging on my wall. I did get the tiny little picture next to it - an oil painting of flowers which will hang next to a couple of other vintage pieces I own in my bedroom. I really, really need a return trip as I loved this shop so much. We wandered around a couple of other great stores for lifestyle and interiors in Malton although I didn't take any photographs as they were all too busy. 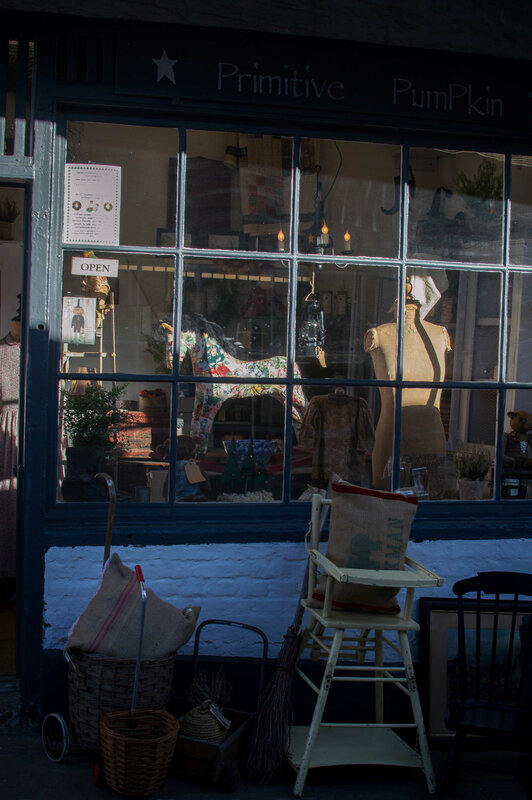 Hare & Wilde is a beautiful homewares store filled with beautiful rugs, lighting, throws and simple tablewares. I went in to look at a pendant light that I've got my heart set on for the living room but the husband has said no as he'll whack his head on it. But I think this is irrelevant as it's a beautiful light. And Kemp's General Store is full of lifestyle products, great unusual gifts for kids and adults including a good selection of books as well as a lovely range of stationary. 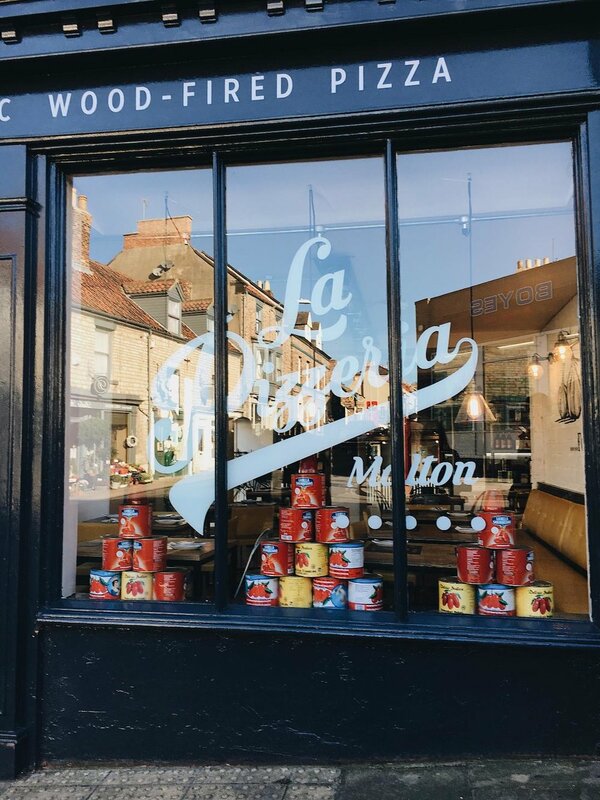 For lunch we headed to La Pizzeria, a new Italian restaurant in Malton that has only been open a few months. The menu range is simple yet has plenty of choice for everyone and caters well for vegetarians (vegans and other diets are catered for too). Everything is cooked on the wood fired oven and the dining area has a lovely laid back feel. Staff are friendly and attentive and it's perfect for family dining. All the pizzas were delicious but by far the star of the show for me was the kids margharita in the shape of a bear head which my friend's daughter Lucy had. She isn't a big eater so we helped finish it off - those ears were the best thing I've eaten all year! After lunch we'd promised the kids an ice cream and it was off for a wander to Talbot Yard Food Court. 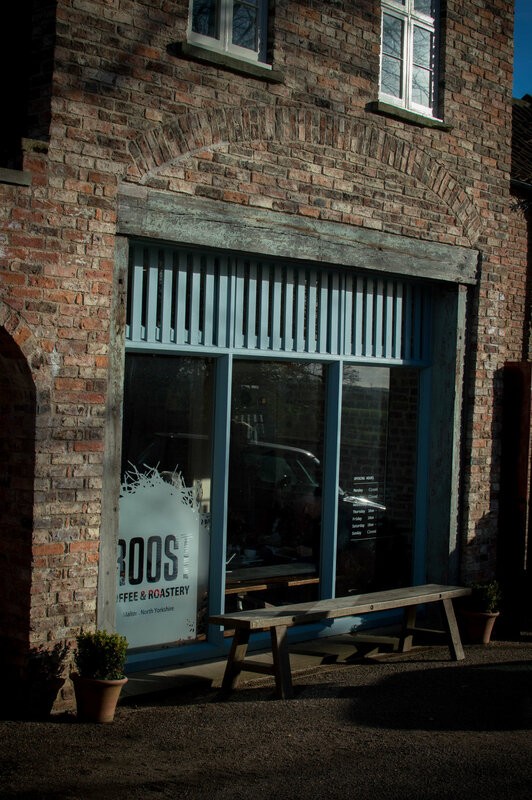 Nestled in a converted coaching yard, it is home to six artisan producers - the gin distillery Rare Bird, which also holds a gin school, a butcher, UK Pastry Champion Florian Poirot's bakery/patisserie, the Bluebird Bakery, Roost Coffee and the Groovy Moo Gelato shop. I opted for a coffee at Roost as I didn't really fancy an ice cream after all that pizza but as always the kids found room for the sweet treats. Their eyes nearly popped out of their heads when they saw the range of ice creams on offer and the dazzling display - bakewell tart with cherries on the top, chocolate orange with slices of real oranges, rocky road, Oreo, salted caramel brownie and for the festive season, mince pie flavour! (which you can see in the middle picture above). 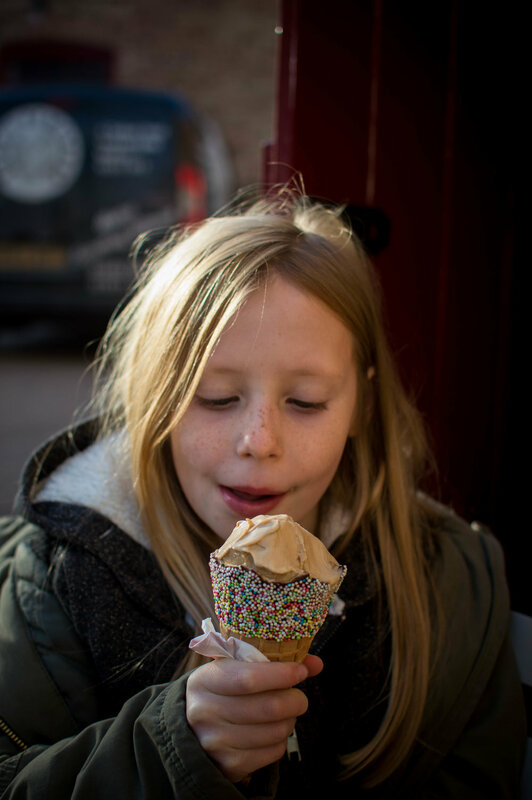 We sat outside in the warm November sunshine eating ice cream and drinking lattes before returning back to the beautiful village of Thornton-le-Dale where we were staying for the weekend. More on that soon. Malton was the perfect stop if you are a foodie lover like me. Next up on their events list is the Dickens Christmas Festival on 8th December. Dickens was a regular visit to the market town and based Scrooge's office on The Counting House in Malton. You can find out more about it here. The Christmas Food Market is on 9th December and dates for next year can be found here. We'll definitely be heading back for one of those.